I really try to have at least one crock pot meal a week for our busiest day. It's nice to have dinner ready to go whenever you need it! I found this recipe on Fabulously Delicious and it sounded yummy, was healthy, and I could throw it all in the crock pot...awesome! 1.Heat the olive oil in a large skillet; season the chicken thighs with salt and pepper. Sprinkle 1/4 cup cilantro over the chicken thighs; brown the chicken in the frying pan, 3 to 5 minutes each side. 2. Arrange the chicken in the bottom of a slow cooker. 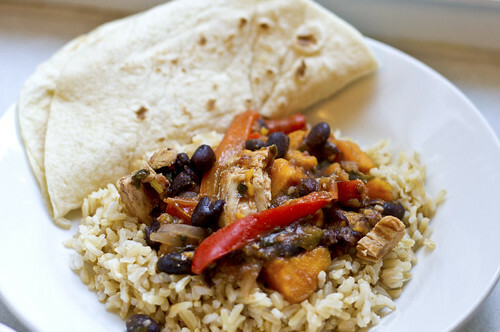 Place the sweet potatoes, red bell pepper, and black beans on top of the chicken. Mix together the chicken broth, 1/4 cup cilantro leaves, salsa, cumin, allspice, and garlic together in a bowl; pour into the slow cooker. Set slow cooker to LOW and cook for 4 hours. Garnish with lime wedges to serve. This salad from Taste Buds was SOOO delicious and a perfect lunch to make and have on hand during the week. I used brown rice instead of the orzo to keep it gluten-free and also threw in some chicken to add a little protein and help feel me up. I LOVE it and can't wait to go eat more today!!! 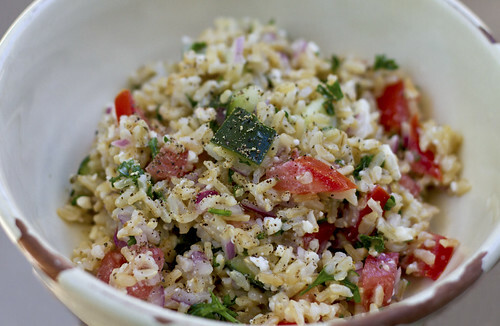 I have never been to Rumbi, but when I saw this recipe on Favorite Family Recipes I thought it looked really delicious and was intrigued by the combination of flavors and ingredients used. Her picture looks much more appetizing than mine though - I was in a hurry so I used my food processor to chop all the veggies, which left much smaller pieces. In my opinion the sauce makes this meal! I loved the rice and the chicken and veggies are just ok, but when you combine the two together and top it with the sauce it is heavenly! Loved it!!! Heat vegetable oil in a large skillet over medium-high heat. Add carrots, celery, zucchini, and broccoli (pretty much equal parts of said vegetables.. you can add more or less veggies depending on your taste). Saute ONLY until vegetables are crisp tender. About 1-2 minutes tops. 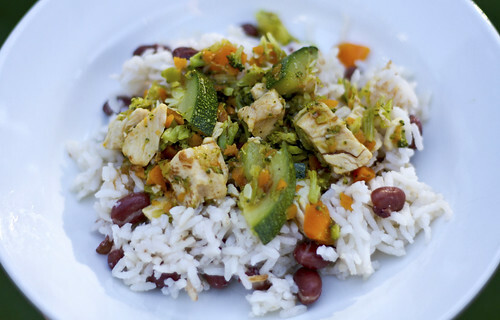 Serve over Rumbi rice and top with chicken. Serve with Spicy Hawaiian Teriyaki Sauce on the side. Combine all ingredients in a rice cooker. Gently stir it all together so the beans are all mixed. Place the lid on and start the rice cooker. Fluff rice with a fork before serving. My oldest saw this recipe a few weeks ago in the Friend magazine and has been begging to make them ever since. We finally squeezed it in this past weekend just in time for Easter. The dough itself isn't actually sweet, so I actually preferred them without the glaze as a dinner roll. The kids, of course, LOVED them frosted though! It was a fun little activity that we'll be sure to repeat next Easter! 2. Sprinkle yeast in the warm water and set aside. 3. 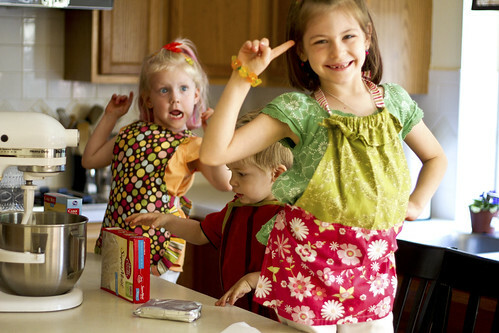 In another bowl, blend milk, sugar, shortening, and salt. Cool until lukewarm, then add eggs, water with yeast, orange juice, and orange peel. 4. Stir in flour a few cups at a time to make a soft dough. Let stand for 10 minutes. 5. Knead dough 5–10 minutes on a lightly floured surface until dough is smooth and elastic. Place it in a lightly greased bowl, turning once to grease surface. Cover bowl with a clean towel and put it in a warm place. Let dough rise for 2 hours, or until double in size. Punch dough down and let stand for 10 minutes. 6. On a lightly floured surface, roll dough into a rectangle 1/2 inch thick. Cut dough into strips 1/2 inch wide and 14 inches long. Roll between hands into rounded snake shapes. Cut one strip into pieces 1/2 inch long, and roll into balls. 7. Place one long piece of dough on a greased cookie sheet. Place one end of the strip over the other to make a loop; bring the end that is underneath up and cross it over the other end. Place a ball of dough on top of the bottom loop. 8. Cover bunnies and let rise in a warm place for 45–60 minutes, until nearly double in size. Bake at 375ºF for 12–15 minutes. 9. 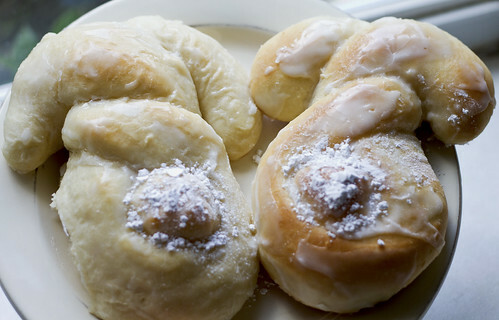 For the glaze, stir powdered sugar, water, and butter together. Frost bunnies with the glaze while they are still warm. I recently hosted a Pampered Chef party and the consultant gave me an old Season's Best recipe book (from spring/summer 2010). These tacos were inside and were soooo good! 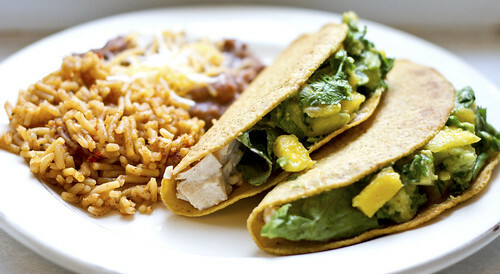 I loved the chicken mixture in combination with the cool mango and avocado salsa. Every member of the family loved them! 1. Prepare taco shells according to package directions; set aside. Shred lettuce. Zest limes to measure 1 tsp. Juice limes to measure 3 tbsp. Place zest, 1 tbsp of the juice, mayonnaise, cumin and cayenne pepper in bowl; mix well. Spoon about 1/3 cup of the sauce into resealable plastic bag; twist to secure and set aside. Add chicken to remaining sauce; mix well. 3. Place lettuce into taco shells. Top evenly with chicken mixture, jicama mixture and avocado. Trim corner of sauce-filled bag; drizzle over tacos. So, it's been a little more challenging finding recipes that sound tasty AND are healthy. The May 2011 issue of Family Circle had quite a few that fit the bill though and this was the first one I tried. It was awesome- light but still flavorful. I only wish I had been able to find bok choy (I went to two stores and niether had it), but maybe next time I can get it! I gave the kids theirs on spaghetti noodles and Mike and I ate ours on Jasmine rice, it was a winner both ways. 1. In a medium bowl, whisk together broth, soy sauce, cornstarch, hoisin, vinegar and sriracha sauce. Set aside. 2. Heat a large nonstick skillet or wok over medium-high heat. Add 1 tablespoon oil and stir-fry chicken for 3 minutes or until no longer pink inside. Remove to a plate and reserve. 3. Add remaining tablespoon oil to skillet along with bok choy, onion and garlic; stir-fry 3 minutes. 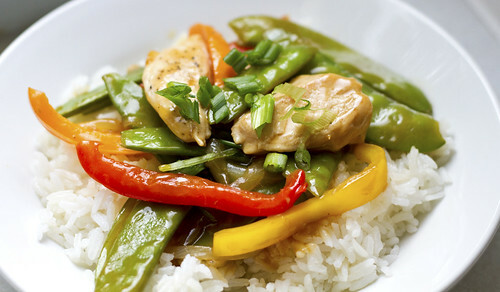 Add snow peas and peppers and stir-fry 4 minutes or until vegetables are crisp-tender. Cover part of the time. 4. Stir in reserved sauce and chicken. Bring to a simmer and cook until sauce starts to thicken, about 2 minutes. Turn off heat. 5. Transfer to a large serving bowl and stir in the cooked noodles and sesame oil. To serve, spoon into individual bowls and garnish with scallions. I saw these adorable little guys on The Recipe Club and knew I had to try them! They were soooo good! I doubled the recipe and ate way too many, but we shared lots of them too :-). They weren't even hard to make, especially since I used store bought frosting (I have bad luck with frosting), but they look super impressive. The kids LOVED helping with them and then eating them when we were finished. In a large bowl, with an electric mixer, cream together cream cheese, oil & eggs until smooth. beat in water, cake mix & vanilla. spoon into lined cupcake pans, filling about 2/3 full. bake at 350 degrees for 18-22 minutes. Pour cream of coconut into a small bowl. stir until all combined. 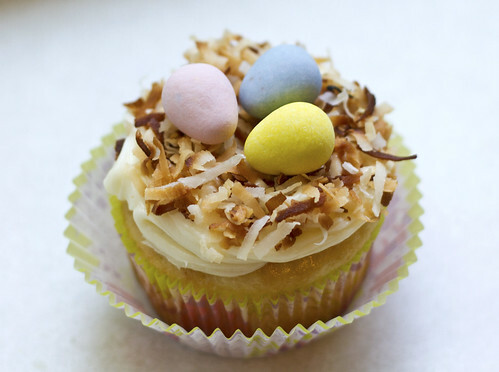 while cupcakes are still hot, poke a few holes into the top of the cupcake with the back of a wooden spoon. 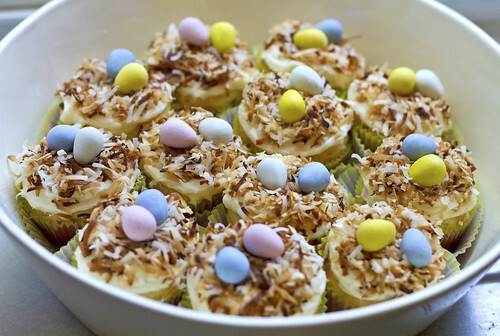 spoon cream of coconut over each cupcake one tablespoon at a time, you might have to use your spoon to guide into the hole. let cool completely before decorating. when cooled, spread whipped cream onto the cupcake. 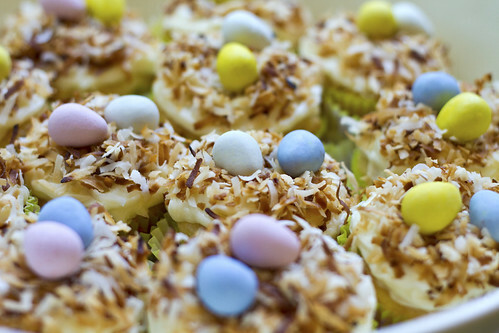 sprinkle with toasted coconut & top with candy eggs. I found this recipe on The Recipe Club and was so excited to try it despite our warm weather. It was sooo delicious! Even all three of kids wanted seconds (even though they mostly drank the yummy broth). It offers such a unique blend of flavors and is healthy too (and it comes together really quickly, especially if using canned chicken). Definitely a new favorite for me! Lightly salt & pepper chicken breasts on each side. grill or broil until browned & cooked through. cut into bite size chunks. 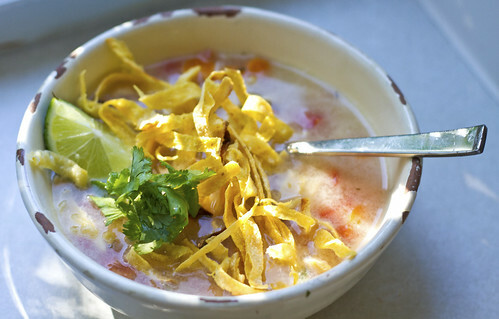 Ladle into bowls & top with tortilla strips & a lime wedge. Not a great picture, but this Pampered Chef recipe is SOOO good! My mom made it for our family get together on Sunday and it is delicious! Lots of cheesy goodness, with the great flavor of the salsa and the fresh veggies, all on top of a crispy pizza crust - you can't go wrong :-)! 1. Preheat oven to 425°F (220°C). Lightly brush Large Bar Pan with vegetable oil using Chef's Silicone Basting Brush. Unroll dough onto bottom of pan, gently stretching and pressing dough to cover bottom. Bake 12–14 minutes or until crust is golden brown. 2. Meanwhile, coarsely chop onion and jalapeño with Food Chopper. Grate cheese with Ultimate Mandoline fitted with grating blade. In Classic Batter Bowl, combine onion, jalapeño, 1/2 cup (125 mL) of the cheese, chicken, taco sauce and garlic pressed with Garlic Press; mix well using Small Mix ‘N Scraper®. 3. Remove pan from oven to Stackable Cooling Rack. Sprinkle 1 cup (250 mL) of the cheese evenly over crust; top with chicken mixture and remaining cheese. Bake 6–7 minutes or until crust is deep golden brown and cheese is melted. Remove pan from oven to cooling rack. 4. Slice tomatoes lengthwise into quarters using Utility Knife. Coarsely chop cilantro. 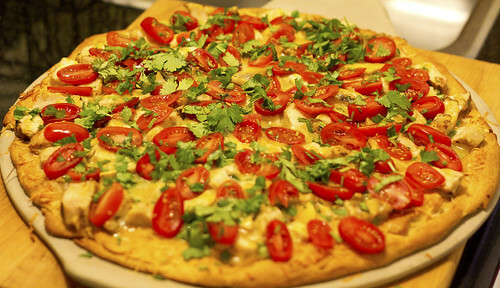 Sprinkle tomatoes and cilantro over pizza. Cut pizza into 12 rectangles with Pizza Cutter. Serve using Mini-Serving Spatula.